Siemens and Alstom have signed a Memorandum of Understanding to combine Siemens’ mobility business including its rail traction drives business with Alstom. Siemens will receive newly-issued shares in the combined company representing 50% of Alstom’s share capital on a fully diluted basis. The merger will join Europe’s biggest two rolling stock builders, and has been rumoured in the past. Global headquarters as well as the management team for rolling stock will be located in Paris area and the combined entity will remain listed in France. Headquarters for the Mobility Solutions business will be located in Berlin, Germany. In total, the new entity will have 62,300 employees in over 60 countries. “This Franco-German merger of equals sends a strong signal in many ways. We put the European idea to work and together with our friends at Alstom, we are creating a new European champion in the rail industry for the long term. This will give our customers around the world a more innovative and more competitive portfolio”, said Joe Kaeser, President and CEO of Siemens AG. “Today is a key moment in Alstom’s history, confirming its position as the platform for the rail sector consolidation. Mobility is at the heart of today’s world challenges. Future modes of transportation are bound to be clean and competitive. Thanks to its global reach across all continents, its scale, its technological know-how and its unique positioning on digital transportation, the combination of Alstom and Siemens Mobility will bring to its customers and ultimately to all citizens smarter and more efficient systems to meet mobility challenges of cities and countries. By combining Siemens Mobility’s experienced teams, complementary geographies and innovative expertise with ours, the new entity will create value for customers, employees and shareholders,” said Henri Poupart-Lafarge, Chairman and Chief Executive Officer of Alstom SA. The new entity will benefit from an order backlog of €61.2 billion, revenue of €15.3bn, an adjusted EBIT of €1.2bn and an adjusted EBIT-margin of 8.0%, based on information extracted from the last annual financial statements of Alstom and Siemens. In a combined setup, Siemens and Alstom expect to generate annual synergies of €470 million latest in year four post-closing and targets net-cash at closing between €0.5bn to €1.0bn. The envisaged transaction is unanimously supported by Alstom’s board (further to a review process of the preparation of the transaction by the Audit Committee acting as an ad hoc committee) and Siemens’s supervisory board. Bouygues fully supports the transaction and will vote in favour of the transaction at the Alstom’s board of directors and at the extraordinary general meeting deciding on the transaction to be held before July 31, 2018, in line with Alstom’s board of directors’ decision. The French government also supports the transaction based on undertakings by Siemens, including a standstill at 50.5% of Alstom’s share capital for four years after closing and certain governance and organisational and employment protections. The French government confirms that the loan of Alstom shares from Bouygues SA will be terminated in accordance with its terms no later than October 17 and that it will not exercise the options granted by Bouygues. Bouygues has committed to keep its shares until the earlier of the extraordinary general meeting deciding on the transaction and July 31 2018. In France, Alstom and Siemens will initiate Works Councils’ information and consultation procedure according to French law prior to the signing of the transaction documents. If Alstom were not to pursue the transaction, it would have to pay a €140 million break-fee clause. The transaction will take the form of a contribution in kind of the Siemens Mobility business including its rail traction drives business to Alstom for newly issued shares of Alstom and will be subject to Alstom’s shareholders’ approval, including for purposes of cancelling the double voting rights, anticipated to be held in the second quarter of 2018. The transaction is also subject to clearance from relevant regulatory authorities, including foreign investment clearance in France and anti-trust authorities as well as the confirmation by the French capital market authority (AMF) that no mandatory takeover offer has to be launched by Siemens following completion of the contribution. Closing is expected at the end of 2018. Guarantee that Alstom+Siemens could build new trains for HS2 and possibly new trains and rolling stocks for Crossrail 2 and London Underground's Bakerloo, Piccadilly, Central and Waterloo & City lines. 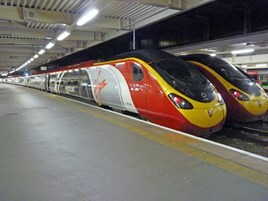 As well new trains for other train operators.